The Olde Tyme commercial nut butter grinder is the world’s premier peanut butter maker. In use in natural food stores across the U.S. and around the world, it can be used to make smooth cashew butter, pistachio butter, and organic almond butter. Designed to allow use as a self-serve nut butter machine, the Olde Tyme lets your customers grind their own macadamia nut butter, hazelnut butter, pecan butter, and much more. You choose the nuts to use, so you can make natural organic peanut butter. The Olde Tyme has a 100% duty cycle so it’s capable of running for hours in a small scale food production enterprise—with your recipe and the Olde Tyme nut butter machine you can make the most delicious almond butter cookies ever! Grind raw nut butters. The possibilities are endless with the world’s best nut butter grinder. Click for full details on the Olde Tyme, or to order. And you have questions, please give us a call. Pleasant Hill Grain is a national leader in milling solutions, and we’re here to help you find the perfect product for your needs! This is a photo of peanut butter from the food processor attachment for the Bosch Universal Plus kitchen machine. Results with the Cuisinart Food Processor are identical. 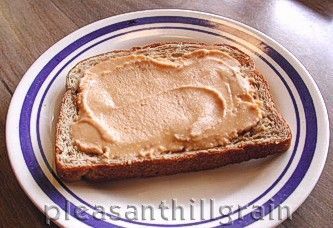 No oil was added, and as you can see, the peanut butter is very creamy and spreadable. The sample shown ran five minutes in the Bosch food processor attachment (a batch of two cups of roasted peanuts.) Chunky style nut butter can be made easily by taking some nuts out of the food processor early and tossing them back in at the end and running another twenty seconds or so. Unlike peanuts, tree nuts like almonds don't make a creamy nut butter like this in the food processor—they become almond meal, instead. 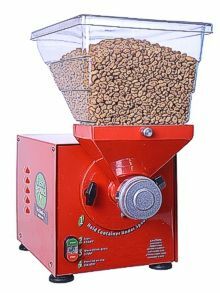 The Olde Tyme commercial nut butter machine will grind almond butter as well as peanut butter. Please see the links below for various nut butter machine options.